… and relax! 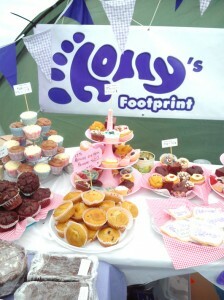 | Holly's Footprint..
Home › Events › … and relax! Well, Hayfield Country Show is at an end now and I think we can say without any doubt that it was a great success for Holly’s Footprint. The weather was unusually summery – Country Show regulars will know from experience that this is not always the case – and there was a good crowd in attendance. It’s been an incredibly busy couple of days (and indeed for the week or two before hand) and I think most of us are ready (and deserve) to take a moment to chill out. Through the many, many, MANY generous donations of cakes, biscuits and brownies and of time spent manning the tables, painting faces, collecting around the site with “Brian and Lois” (the teddy bears), selling quiz sheets we have raised a considerable sum of money which we’ll let you know about when it has all been totted up. We need to thank EVERYONE who has contributed to this weekend’s event. So many people have given their time and skills without a second thought to make it a success… it’s truly humbling. And of course everyone who bought items or donated need to be thanked too. THANK YOU ALL. I will say a particular thank you to the organisers of Hayfield Country Show who have been very generous and accommodating to us, to Chris Smith who loaned us his event shelter for the weekend, to St Johns Church for the tables and to Andrew Thatcher of Monster Displays who kindly supplied our banners. Now begins the task of reuniting the many thousands of tins, trays and Tupperware with their rightful owners.